Please read the prospectus in its entirety, including drop-down menus (indicated by the yellow bar and blue down arrow), before submitting an entry. The Northern Arizona University Art Museum announces a juried exhibition to be mounted in Spring of 2020. Open from February 4 until April 4, the exhibition, titled “May You Live in Interesting Times,” will present new works conceived within the conceptual category of the Book as Art, including Altered Books. The Museum invites submissions on significant themes derived from the issues we face here and around the world, including, but not limited to, environmental challenges, politics, immigration, race, and nationalism. Our 2020 exhibition will embrace widely varying conceptions of the “book” created in an equally diverse range of media. The Museum is producing this event in the firm belief that, in the age of virtual media, there is still a profoundly powerful effect to be drawn from prolonged interaction with a physical artifact in a “screen-free” environment. Open to all artists practicing in the United States of America. All books as art exclusive of commercial reproduction are eligible. 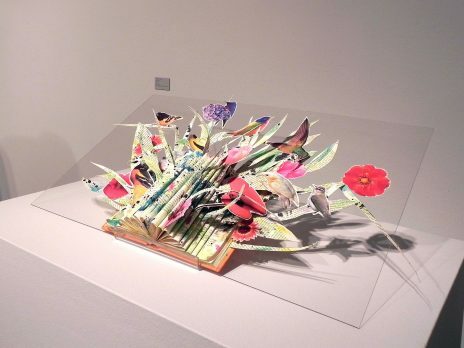 We encourage submissions that take book arts beyond traditional. Each artist may submit up to three images for each of his/her works completed in the last two years. Works over 50 lbs. may require additional shipping fees charged to the artist. For artworks over 150 lbs. or larger than 42” cubed please contact the museum before submitting your entry. High quality, print ready, digital JPEG or PDF files must be submitted (uploaded) with your entry form. When you access the entry form, you will be asked to provide some info about yourself. Then for each entry, you will have the opportunity to enter title, dimensions, etcetera; when given the option of 2D or 3D for your artwork, select 3D. You will then be given the opportunity to upload up to three images for that artwork. You are allowed three artwork submissions (total of nine images) Each file name must correspond with the title on the entry form and include your first initial and last name (e.g. TITLE OF ARTWORK_A-Artistname); longer titles can be truncated. You may include the title of the artwork in your image submissions, however, do not include your name on the image, and if on your book, please blur out or remove from submission image. This will allow for a ‘blind’ adjudication of the artwork. A nonrefundable entry fee of $35 entitles the artist to submit one to three artworks, with three digital images per entry. Entry fees will be submitted along with the online entry form, after completing the personal contact info page and artwork summissions sections of the entry form. Credit card (Visa, Mastercard, American Express, Discover, JCB) and electronic checks are accepted. All works for the exhibit are to be sent with shipping prepaid. NAU Art Museum will provide return shipping expenses for works presented in the exhibition (see “Eligibility” regarding works over 50 lbs.) All work must be either professional crated or double-boxed. Please also include packing and unpacking instructions. NAU Art Museum reserves the right to refuse acceptance for any packaging that arrives in questionable condition. Hand-delivered work must be picked up by April 24, 2020. All works must be display ready and including display instructions. Identification labels must be attached to the bottom/back of work. Actual work recived by the Museum must match image chosen by jurors; no substitutions accepted. Artists’ work will be insured while on exhibit. NAU is not liable for damage or loss in transit. Sending entry constitutes agreement of the entrant to all conditions stated above. Additionally, a Loan/Display Agreement will be sent to artists whose work is selected into the exhibition.